“Beware of the ides of March,” is a very popular phrase made famous by William Shakespeare in his play Julius Caesar. The term corresponds to the date March 15th in present day calendars and also marks the time of the assassination of Caesar in 44 BC. The assassination of Caesar started the transformation of the Roman Republic to the Roman Empire and Rome’s dominance in the world at the time. While the Roman Empire of yesteryear stood strong as one of the world leaders in its day, today’s Roman Empire stand’s strong as one of the top fashion leaders around the world. Many of today’s leading fashion designers and fashion houses: Girogio Armani, Salvatore Ferragamo, Miuccia Prada, Dolce & Gabbana, Versace, Fendi, Gucci and Bvlgari all hail from Italy. The luxury house Fendi in fact, started as a fur and leather shop in Rome during 1925. The Fendi brand is renowned today as a premier luxury house of fine leather goods, furs, fragrances, sunglasses and wristwatches. You can find the iconic Italian brand’s timepieces at TheWatchery.com, where you’ll enjoy exceptional savings on popular men’s and women’s timepieces. 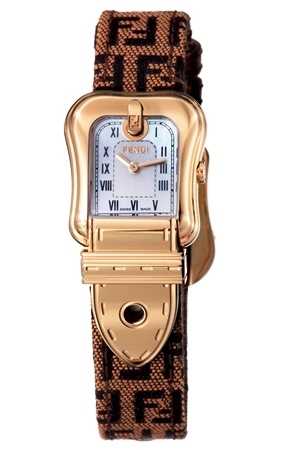 The Fendi B women’s watch in polished gold plate captures the essence and glamour of the fashion house. The gold plated buckle-shaped case is polished to a mirror-bright patina. The case is presented on the emblematic strap featuring the legendary Fendi logo and a calfskin leather back. The luminous Mother-of-Pearl dial shines with gold colored hands and black Roman numeral hour markers. Premium features include Swiss made quartz movement, an anti-reflective sapphire crystal and water resistance to 30 meters. Women’s fashion watch is 23mm wide and 7mm thick. Valentine’s Day is three weeks away and there are many excellent choices to consider for your Valentine, but nothing says passion and romance more than a timepiece from the iconic Italian fashion house Fendi. Fendi wristwatches for women offer true emotion on the wrist with their bold and daring designs and innovative flair for fashion. Founded in 1925, Fendi started as a leather and fur shop in Rome. The brand’s innovative handbags, captivating collections of furs and trend-setting timepieces have made them a world leader in luxury goods for over four decades. You’ll find a splendid array of Fendi women’s watches on sale right now at The Watchery … from leather strap watches with signature belt buckle design cases and bezels to trend-setting diamond and ceramic models … too emblematic styles featuring the distinctive Fendi logo on leather straps and bracelet links. The Fendi Orologi timepiece for women is a real eye-opener. The sleek architectural inspired styling features a square case in stainless steel, highly polished to a mirror-bright patina. The column design lugs and double F logo link bracelet in polished steel add to the modernistic design. The raised, highly polished bezel frames the black patterned dial with a white Mother-of-Pearl outer dial featuring silver colored sword hands and Roman numeral hour markers. Additional features include precise Swiss-made quartz movement for time-keeping accuracy and water resistance to 165 feet. Watch is 20mm wide and 7mm thick. 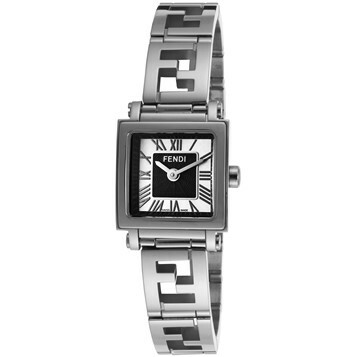 Free domestic shipping is included on all Fendi wristwatches at The Watchery.